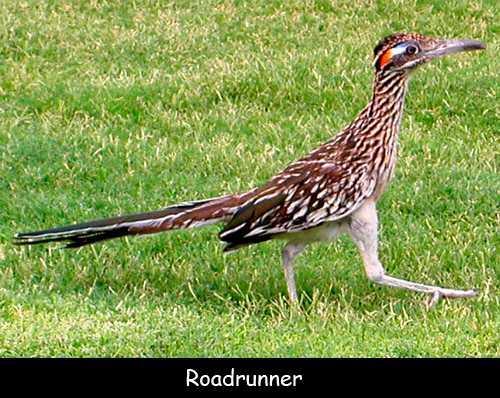 Roadrunner belongs to the Cuculidae family of birds that also includes cuckoos, koels etc. They are native to the South-Western desert in North America and gained this name from their habit of running on the road towards cars. These fast and fiery birds are well adapted to their environment. They do not need to drink water as they get all the required moisture from their food. Their diet consists of beetles, grasshoppers, spiders and other insects. They are one of very few animals that can prey upon rattlesnakes. It is also the reason behind a nickname given to them ‘the snake killer’. A roadrunner measures 18 to 24 inches from its tail to beak and weighs around 8 to 24 ounces. They are monogamous birds which mean males and females mate with each other for life. Female birds lay 3 to 10 eggs at once and the chicks hatch after about 20 days. Both the parents work together to guard and look after their hatchlings. The Greater Roadrunner can eat poisonous snakes and lizards as well. They prey upon them with cooperative actions. Their average lifespan in the wild can range anywhere from 6 to 8 years. They can run at a speed of 15 miles per hour and sprint at a speed of 26 miles per hour. These birds can make a variety of vocalizations including buzz, coo, whirr etc. They usually prefer dry, barren and scrubby habitat like canyons, deserts, open fields etc. Roadrunners are extremely territorial and often patrol their territory and chase any intruder away.